The module NeoRecruit Search Offers is now Joomla 3 ready ! The module NeoRecruit Search Offers is now compatible with Joomla 3 too ! So you can now display a job offers search form on any page of your Joomla! 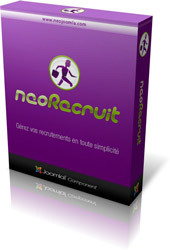 website, and this form will redirect to a selection of offers in the component NeoRecruit. This module NeoRecruit Search Offers is always free, and is easily downloadable in the "Extensions" section of the portal. Next step : the update of the module NeoRecruit Categories.